[151 Pages Report] The Internet of Things (IoT) cloud platform market is estimated to grow from USD 1.88 billion in 2016 to USD 7.15 billion by 2021, at a Compound Annual Growth Rate (CAGR) of 30.6% during the forecast period. The base year considered for the study is 2015 and the forecast period is from 2016 to 2021. Artificial intelligence, digital healthcare technology, robotics, and data analytics are some of the disruptive technologies likely to impact the future of the IoT cloud platform market. The integration of IoT cloud platform helps enterprises’ IT infrastructure to monitor, analyze, and control the main network connectivity. Platforms such as device management and connectivity management has high global acceptance in the IT industry; however, the emerging application enablement platform is expected to witness high growth rate. The global IoT cloud platform market is expected to grow significantly during the forecast period. North America is expected to hold the largest share of the IoT cloud platform market, followed by Europe. Sensors are the most important type of IoT devices, which help in generating information about a physical event or state. Sensors can measure everything in their surroundings. These measurements include orientation, motion, light, sound, humidity, and temperature to biometrics, such as blood pressure and heart rates. These sensors will drive the practicality of the IoT across industry verticals for various application areas. Also, continued innovation in sensor technologies is expected to expand the IoT capabilities much further and make the devices very compatible to the IoT platform. This report aims to estimate the market size and future growth potential of the IoT cloud platform market across different segments such as platforms, deployment models, application areas, organization size, services, and regions. The report also focuses on information regarding the key factors (drivers, restraints, opportunities, and challenges) influencing market growth. Additionally, the opportunities in the IoT cloud platform market are providing strategic profiles of the key players to stakeholders present in the market. Allowing the stakeholders to comprehensively analyze the core competencies, and to draw the competitive landscape of the market. The IoT cloud platform market ecosystem comprises IoT cloud platform providers of platforms such as AWS Group (U.S.), Google (U.S.), IBM Corporation (U.S.), and Microsoft Corporation (U.S.), and service providers such as PTC (U.S.) and IBM Corporation (U.S.) that maintain and update the entire software system and sell them to end users to cater to their unique business requirements. In April 2016, IBM partnered with Kimberly-Clark, a U.S. based company. The Kimberly-Clark's Professional division will adopt IBM Cloud and IBM Watson IoT platform to develop a new intelligent facilities management app. In July 2016, Google acquired Anvato, a U.S. based company providing cloud based video editing. This acquisition will allow Anvato to gain scalable technology and the power of Google cloud platform to offer OTT and mobile video. Which region hold the maximum opportunity of growth in IoT Cloud Platform market? MarketsandMarkets forecasts the Internet of Things (IoT) cloud platform market size to grow from USD 1.88 billion in 2016 to USD 7.15 billion by 2021, at a Compound Annual Growth Rate (CAGR) of 30.6%. Increasing adoption of intelligent/smart devices and cost-effective & easily deployable cloud data storage are some of the key factors driving the IoT cloud platform market. Other driving forces include the growing need for operational efficiency and evolution of high-speed networking technologies. The IoT cloud platform market is broadly classified into platforms, services, organization size, deployment models, application areas, and regions. The platform segment is further divided into device management, connectivity management, and application enablement platform. Compared to platforms, the services segment is expected to grow at the higher CAGR during the forecast period. The services in the IoT cloud platform market are aimed at enabling smart and coordinated decision making processes and mitigating the risks and vulnerabilities of the market using efficient tools and techniques. Moreover, these services enhance customer experience and help to meet the end-to-end needs of all the allied industries. The public deployment model is expected to grow at the highest CAGR during the forecast period as a majority of small and medium businesses adopt this model because of cost-efficiency. Moreover, public cloud deployment offers flexibility and scalability to customers, which helps them increase operation efficiency and data bandwidth as per their requirement. 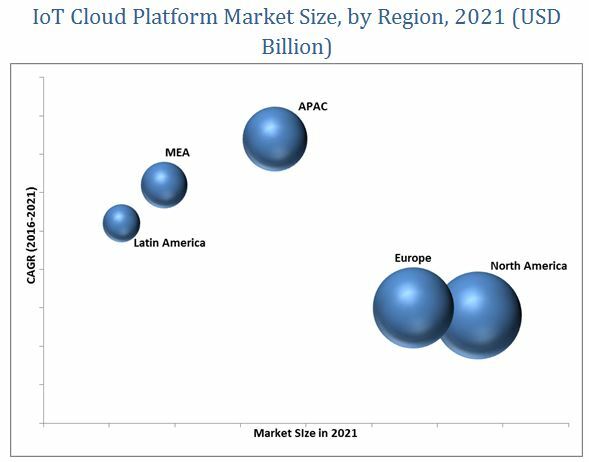 The IoT cloud platform market is segmented across five regions, namely, North America, Asia-Pacific (APAC), Europe, Middle East and Africa (MEA), and Latin America, wherein detailed analysis is provided. North America is projected to dominate the IoT cloud platform market during the forecast period owing to technological advancements and early adoption by diverse industries in the region. The market of APAC is expected to grow at the highest CAGR between 2016 and 2021. The reason for this is increasing smart cities projects in India, Singapore, and China. Also, the rise in industrial automation in APAC has accelerated the growth of IoT cloud platform in this region. IoT cloud platform is expected to have extensive growth opportunities in the Middle East owing to the huge IoT investments in manufacturing, transportation, and utilities. IoT technology presents many business opportunities for home automation companies. The IoT platform has developed “Smart home concept”. Moreover, home automation is creating a new paradigm of intelligent future homes. It integrates all electrical devices into one centrally connecting system, allowing it to follow an authorized command in the form of voice, password or bio-print; for instance, a voice command of turning on/off a music system or an AC adjusting its cooling according to the room temperature. Home automation is beneficial in not only saving money by efficiently using energy and other resources, it also controls and monitors house-holds security by checking all the security locks, Wi-Fi enabled cameras, and fire security devices such as smoke alarm and water sprinklers. For safety, the system checks smart motion sensor against water leakage and short-circuits. Wearable technology has made IoT an integral part of human life. Wearable technology uses the application of enabling sensing technology to communicate “things” with cloud and big data. The wearable technology taps data by connecting to a third party and provides much customized and tailored services. Companies such as Apple, Google, Samsung, Nike, Motorola, and Johnson & Johnson have come up with wearable devices with host connected to central system. Apple iWatch, Google glasses, and Samsung wrist watch are some of the various products that are tapping IoT market. Smart devices and associated technologies continue to rise exponentially. These include ultra-low power processors, accurate, low-cost, ultra-low power mobile sensors, and low-power wireless connectivity. Wearable devices offer many benefits of safety, health tracker, interactions, and fitness. With the increasing interest of consumers in wearables devices, there is a huge opportunity for the manufacturers to diversify their wearables offerings. IoT is connecting companies and governments through smart prospects, such as smart cities and smart utilities, for them to get location-based data in real-time. Smart city is among the most effective platforms to integrate IoT. The concept of smart city is aimed at promoting economic growth, strengthening governance, improving the quality of life and sustainable use of energy. Smart cities are developing highly advanced ecosystems with ICT to make it more livable, sustainable, and responsive to urban challenges. These will make optimal use of the interconnected infrastructure enabled by IoT for the better management of limited resources. IoT can play a crucial role in disaster management, pollution control, traffic management, waste management, water management, and in many others for improving the quality of life. The industrial automation is going through a major transformation with the growing IT industry, tremendously increasing internet connectivity, and intelligent device usage, which has increased the opportunities for businesses; therefore, making industrial automation, a growing segment for IoT. Therefore industrial automation is implementing an intelligent manufacturing infrastructure for increasing safety & efficiency and lowering costs. These industrial automation processes involve industrial control systems, such as Supervisory Control and Data Acquisition (SCADA) systems and Distributed Control Systems (DCS), which secure the channels by controlling the remote equipment that can be distributed geographically. A wireless IoT protocols will expand connectivity and ensure easier integration across the manufacturing sites. The transportation industry relies heavily on the easy movement of goods and freights. IoT cloud platform provides technologies to manage and maintain roadways, railways, and aircrafts. Incorporating IoT into the transportation system upgrades the outdated systems with intelligent navigation, fleet management, value added services, and monitoring the movement. This helps the transportation authorities to take strategic decisions for performance, enhancing asset life cycle, and maintaining public transit infrastructures. IoT cloud platform offers solutions for transportation to increase productivity and profitability by using IT, thereby improving efficiency and reducing operational costs of the commercial fleet. The IoT technology connects these fleets with speed sensing technology, camera, and vehicle monitoring equipment, RFID, and payment devices. IoT fleet management offers the owner a scalable, is easy to use comprehensive fleet management platform, real-time automobile monitoring and diagnostics GPS location tracking, automated notifications, and reduced operational & maintenance costs. What strategies are the vendors adopting to increase their hold over the market? The adoption of IoT cloud platforms and services is growing at a rapid pace in developing regions, such as APAC and MEA. However, the lack of allied infrastructure, IoT skills, and awareness about IoT technology prevent these regions from adopting IoT cloud platforms and services. Moreover, the lack of data security and privacy acts as a major restraining factor for the growth of the IoT cloud platform market. On a strategic front, many companies are utilizing different growth strategies, such as mergers & acquisitions, partnerships & collaborations, and product developments to increase their share in the market. For instance, in August 2016, Amazon collaborated with Nexmo, a global leader of cloud communication platform, to provide worldwide SMS (text) messaging facility via Amazon Simple Notification Service (Amazon SNS). The collaboration will help AWS to expand its Amazon SNS services through Nexmo’s large global network. In line with this, in November 2013, the company launched Amazon Workspaces, Amazon Appstream, and Elastic Compute Cloud. On the acquisition front, in July 2016, Google Inc. acquired Anvato, a U.S. based company providing cloud- based video editing. Some of the major technology vendors include Amazon Web Services, Inc., IBM Corporation, Google Inc., Microsoft Corporation, General Electric Company, Salesforce.com, and SAP SE. 15.2 Amazon Web Services, Inc.